My bead soup beads went off to the post office today at the start of their transatlanctic journey to Canada. I had hoped to make some lampwork beads to co-ordinate with the focal that I sent but sadly my oxygen generator is still broken and today was the last day to post them out. Wouldn't you think that someone who has been making beads day in, day out for over 10 years would have a treasure trove of pretties just waiting to be picked? hahaha, nope not a chance...I think because I couldn't make the beads I wanted to I found it surprisingly tricky to find other beads instead. I started to feel quite anxious about it but then I gave myself a stern talking to and decided to stop being ridiculous! In the end I was happy with my choices and I really hope my partner Elaine likes the beads I have sent. I spent the rest of the day ferrying beads, books and tools upstairs to the new bead emporium. It is starting to take shape but I need to think it out quite carefully as all of the metal fabrication will still have to be done in the shed.... at least I'm getting lots of exercise trotting up and down the stairs! 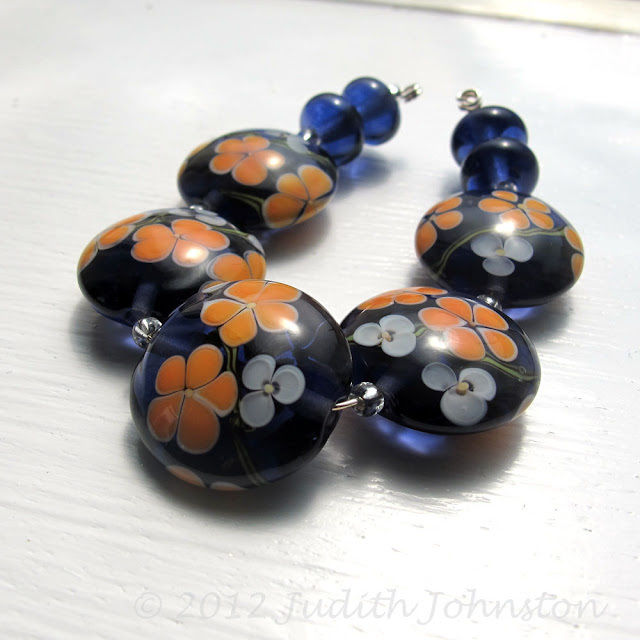 Random flowery bead picture and not at all like the bead soup beads I sent.